English inventor; born in London 1828; died there Nov. 23, 1900. He may be regarded as practically the founder of the British trade in sewing-machines. He early recognized the possibilities of this invention; and introduced from America into England the "Howe," the pioneer machine. Salamon was also the first to establish a plant for the manufacture of bicycles, at Coventry in Warwickshire, at the time when the invention of the spider-wheel resulted in the development of the velocipede into the modern bicycle and tricycle. Under the auspices of his company, the Coventry Machinists, Coventry took the foremost place in the manufacture for which it is now famous. 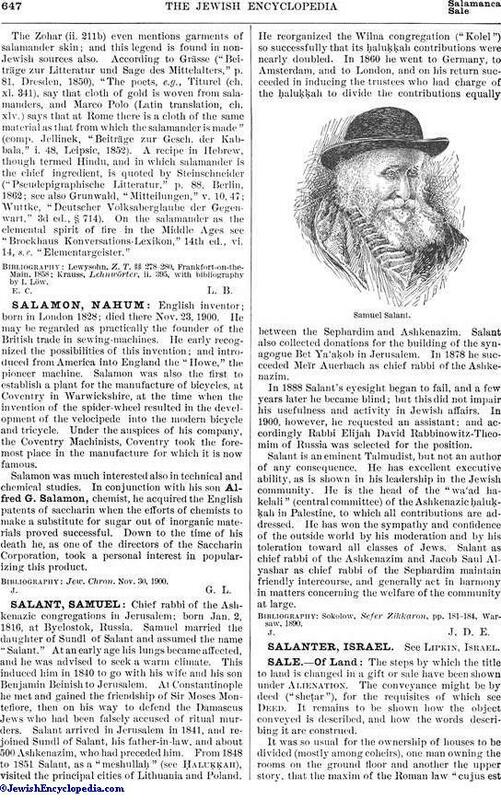 Salamon was much interested also in technical and chemical studies. In conjunction with his son Alfred G. Salamon, chemist, he acquired the English patents of saccharin when the efforts of chemists to make a substitute for sugar out of inorganic materials proved successful. Down to the time of his death he, as one of the directors of the Saccharin Corporation, took a personal interest in popularizing this product. Jew. Chron. Nov. 30, 1900.